We left Kittery and Robert's behind on Friday night and headed to Freeport. We arrived close to 8 and drove through town to see if anything was still open; only LL Bean was. The stores around there tend to close up by 6, sadly. So we went to our bed and breakfast of choice, the Brewster House, checked in and unloaded. Then we hopped back in the car and went to Bean. It's tradition that no matter when we get into town, we always have to go check out Bean. So we strolled around there for a bit, feeling fleeces and flannel sheets, and giggling over tiny ornaments and little cans of Maine blueberries. Then we left and went to bed because the next day was sure to be an exhausting day of shopping. And it was. We had our breakfast (a lovely egg strudel with sausage and scalloped potatoes) and hit the shops (correction, we hit Starbucks and then the shops). We use this trip for Christmas shopping and a little self-indulgence. Case in point: I knew I was buying myself a new pair of Uggs. We stopped once for lunch at the Jameson Tavern. We always remember it as being better than it actually is, which entices us to stop in, but then we're usually disappointed with the food. Maybe since I've written about it this year, we'll remember not to go next year. But in contrast to that, when we finally finished shopping (or the stores closed and prevented us from shopping further), we regrouped, rested up, and ventured out to Conundrum. Conundrum Wine Bistro is one of my all-time favorite restaurants. I only go there one or two times a year, and I wish there wasn't such a long span of time between my visits. Conundrum is dark and cozy inside. This time we were directed to a small table in the back corner. It's right next to the oversized leather couch and coffee table, where some people choose to dine. It was our waitress' third day on the job, but she was spectacular. She brought us our menus and the wine list. I scanned the wine list first, looking for something I might want to try. Somehow the word "monkey" caught my eye. I have a thing for monkeys... so I had to try Barrel Monkeys Shiraz. And with the drinks ordered, it was time to think about food. And for dinner, I ordered what I thought was the robust and velvety beef stew I had always enjoyed in years past. When the stew arrived, I took one bite and knew instantly that something was off. This wasn't my stew. When the waitress came back over, I mentioned to her that the stew didn't taste the way it normally did and asked if the chef had changed his recipe. She went to the kitchen to check and reported back that this was a Guinness beef stew I was eating and that it replaced the bourbon-marinated beef stew I had always enjoyed. I was bit letdown and asked her to suggest that the chefs go back to the old recipe as it was much, much better. Just think about it: Doesn't bourbon-marinated just sound so much more inviting than Guinness? (Even though I do love my Guinness.) Also gone from the menu was the famous shepherd's pie I mentioned in a previous post. My mom had tossed around a few options and finally went with the roasted chicken with creamy mashed potatoes. The chicken was cooked really well and tasted great, but we both agreed the potatoes could not be described as creamy. We think they were just potatoes, with no additions like butter, cheese, milk, or cream. But overall it was a good dish. I don't know how, but somehow we managed to have room for dessert. My mother ordered the apple crumble. And I got the molten chocolate cake, which had a different name that escapes me at the moment. Both of our desserts were amazing. I find that sometimes restaurants focus so much on the food that desserts are a letdown; not so here. The middle of my cake oozed out of its baked shell. It tasted just like underbaked cake batter and had a texture like that of underbaked brownies, maybe a little thinner. I wish I could get my molten cake to come out like this one. Conundrum is definitely a restaurant worth checking out if you're ever in the Freeport area. I recommend it over any of the restaurants in town, and I've been going to Freeport long enough to have tried most of them. No one is pretentious or snobby -- which you might encounter at the Muddy Rudder. And the food is of a higher quality than what you'd find at Jameson Tavern or Gritty's. Although both are great if you just want a beer and some pub food. Because Veteran's Day fell on a Tuesday this year and eliminated the possibility of a long weekend, my mother and I had to rearrange the usual plan for our Veteran's Day shopping weekend in Maine. I took a half day on Friday, and we decided to stop in Kittery for our first round of shopping instead of plowing straight on to Freeport and hitting LL Bean so late that everything else is closed, as we would normally do. We arrived in Kittery around 3:30 p.m. and immediately stopped into the Crate&Barrel outlet. I scanned the store for any new gadgets, dishes, or cookbooks I might want. Somehow I only bought some boxes for giving away Christmas cookies and escaped without buying up everything in the place. We went to a few other stores and decided to stop for a "snack." Unfortunately, there aren't too many options around. There's Bob's Clam Hut, which is great for fried seafood, if that's what you're in the mood for, but we weren't. There's Weathervane, which I really don't like. There's Burger King, which doesn't even count. And lastly, there's Robert's. I love Robert's. I make it a point to go there any time I'm in Kittery. Thinking we would just pop in, sit at the bar, and have a couple of appetizers, we headed in that direction. Drinks were easy enough: The bartender said "raspberry cosmos," and we said, "OK." Then we started looking at the menu... and the specials. Our order ended up being two Duxbury oysters, steamed mussels a la Howard, the fall salad, and the linguine with clams special. So much for a snack! Soon after we ordered, the bartender brought over some crackers and an artichoke spread. 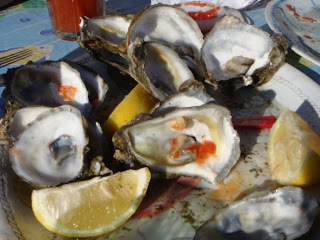 We munched on these and sipped our cosmos until the oysters and mussels arrived. I wasn't in an oyster mood that day, so I didn't have one, but my mother said they were delicious. The mussels a la Howard were definitely my favorite part of the meal. The steamed mussels are served in a bowl of cream sauce with fennel and sausage. I would scoop each mussel out of its shell, swirl it around in the cream sauce, and spear a piece of sausage to eat with it. I've had a lot of steamed mussels in wine sauce dishes before but nothing like this. Then the fall salad arrived. Knowing we were splitting it, the bartender had asked the chef to put it on two plates, so we each got a dish of greens with cranberries and walnuts, topped with goat cheese and a roasted shallot vinaigrette. By that time we were ready for new drinks. My mother ordered a blueberry martini made with Cold River potato vodka. We had been to Freeport earlier this year for a food and drink tasting and had sampled this particular vodka. I found the aftershock too harsh, but my mother didn't. I ordered a pumpkin martini, which I think had rum rather than vodka, as well as some nutmeg... and based on how I slept that night, possibly some espresso. Our entree arrived, also split between two dishes. 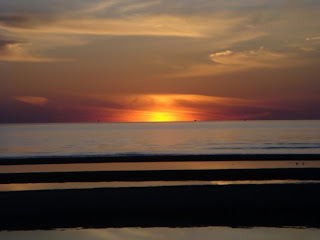 It was wonderful and was my mother's favorite. I loved it but didn't think it took rank over the mussels. And to finish our "snack," we had bite-size desserts. I can't even tell you what a great idea this is. By the time I finish dinner, I usually want dessert but know most of it will go to waste because I'm so full. At Robert's you can get any of the desserts in a bite-size version. My mother ordered the blueberry crumble, and I got the mocha fudge cake. They came served in small ramekins. We had enough to sample our own desserts and try a little of each other's. It was the perfect ending to the meal. 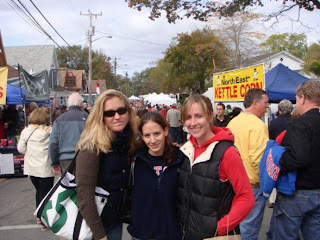 This October I went to the Cape twice -- on Columbus Day weekend (as is tradition) and also the following weekend (to finally check out the Wellfleet Oyster Festival). I was looking forward to my annual visit to The Wicked Oyster. Unfortunately, things didn't start off so well and kept getting worse. I wanted to go the first weekend when my boyfriend was with me, but we had a group of 7 and couldn't get a reservation. We went next door to the Duck Creeke Tavern instead. While it was nice, it was no Wicked Oyster in my book. The following weekend when I returned to the Cape with some friends, we still had a large group that needed to be accommodated. My mother knew how much I wanted to go to the Wicked Oyster and made a reservation at the only time they had available to seat a party of 8: 9:30 p.m. When we got there at 9:15, we were told we would be seated soon. At 10:30 we finally had a table. If there hadn't been a Red Sox game on in the bar and delicious cranberry mojitos to sip, I might have just given up. Our waitress didn't seem to think much of the fact that we had waited an hour for a table we had reserved. When I used to waitress, if I had an upset table, I would work my hardest to make my customers happy, even if I hadn't been the cause of their problem. She clearly didn't think that way. She continued our miserable experience by being somewhat inattentive and blase. But on to the food... I ordered the butternut squash soup and the pan roasted catch of the day. The soup was just ok. My dad makes a better one. And the catch of the day was black cod, served with fingerling potatoes, leeks, and littlenecks in a cream sauce. The fish was nicely cooked and overall I enjoyed the dish. Everyone else seemed to enjoy their meals (sole, fried calamari, lamb ravioli, veggie ravioli), but I think being seated so late and feeling so neglected left us all feeling a bit disappointed with the whole evening. I've had other experiences there that have been wonderful, but this year just left a bad taste in my mouth, and I'm not sure I'll be able to go back for more than a cranberry mojito next year, but hopefully I can remember the good times and give it another chance. Isn't it amazing how sometimes you can go to a place and feel as though you live there even though you don't? For me this happens with the Eastham/Wellfleet area of Cape Cod and Freeport and Kittery, Maine. I go to the Cape every summer and every Columbus Day weekend, and I go to Freeport and Kittery every Veteran's Day weekend. October is my favorite time to head down to the Cape because it's so peaceful, the weather is practically perfect (ok, so some years we've had rain, but other years it's been 75 degrees and sunny), and the traffic doesn't really exist. 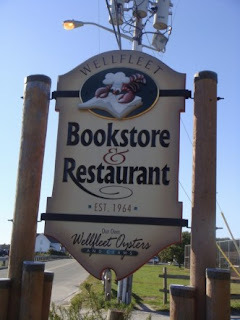 A couple of years ago, my mom and I discovered The Wicked Oyster, a restaurant in Wellfleet. After a cranberry mojitos each, we were hooked. The food is delicious, and we now go every year. When the oyster cravings hit, we head to the Bookstore & Restaurant, where a man known as "the fossil" is always there, shucking away. My mom can stomach the Bloody Marys, but I find them spiked with just a little too much horseradish. In Freeport, we discovered Conundrum. Being a bit farther down the road, it was a nice change of pace from all the restaurants in town. We first went there about three years ago, even though we've been having a shopping weekend in Freeport for much longer than that. November brings some colder weather, and one of my fondest memories of Conundrum is waiting out on the back patio, gathered around huge gas warmers with other patrons, and the cosmos we sipped to keep warm. We always think we can eat more than we can there. The beef stew is listed as an appetizer, but I eat it for my meal now. The shepherd's pie tends to sell out early, as it's a favorite there... and it's easy to understand why. The restaurant is dimly lit and might accommodate about 65 people at the bar, hightops, and regular tables. There's always a crowd. When we tire of Freeport, we head down to Kittery to finish shopping and pay a visit to Robert's Maine Grill and Market. We've sat by the window and looked at the water with my younger siblings in tow. We've gone other times and sat at the bar drinking Bloody Marys and slurping down oysters. I've taken my boyfriend there as well. I've always had a wonderful experience and a great meal. Here, the atmosphere is a total 180 from Conundrum. You walk in to white and light blue and green and a stainless steel bar. Everything is bright in that crisp, clean way. After you place your order, the waiter or waitress will bring over crackers with different butters or spreads. Last time I had a salmon spread of some sort, which I really enjoyed. And now I also have to add The Brewster House to my Freeport list. When we first started making this shopping trip a tradition, we would try a new bed and breakfast each year. Once we found the Brewster House, we felt no need to shop around anymore, so to speak.